for $359,900 with 2 bedrooms and 2 full baths. This 1,779 square foot home was built in 2016. Lovingly cared for home shows like a model. As you enter through the stained glass door, the diagonally set tile, designer accent walls and subway tile will wow you. Two bedrooms, two baths PLUS sun room and bonus room. 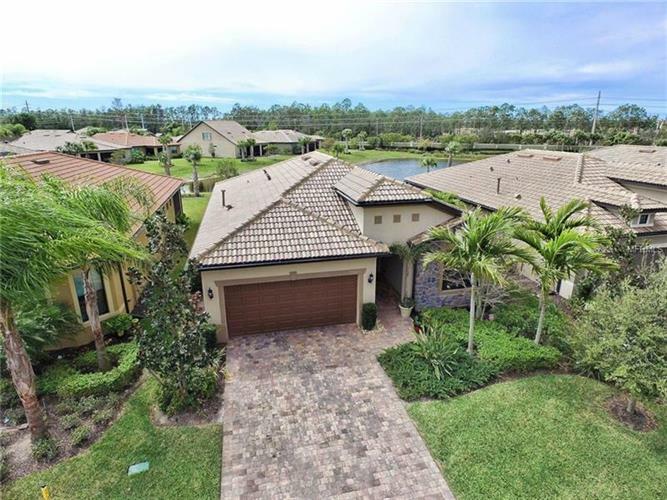 Located in the gated community of Camden Square in Fort Myers, just off Plantation Road. This home boasts numerous builder upgrades plus almost $20, 000 in owner upgrades. The kitchen features 42 inch wood cabinets and island, closet pantry, Stainless appliances, gas range, granite counter tops, subway tile back-splash, plus tile on back of island. Master bedroom has tray ceiling and large walk-in closet. Master bath has dual sinks, vanity with granite top and shower. The large laundry room has sink, cabinets, built-in ironing board, storage area. No shortage of storage with extra closet off garage and two garage overhead units approved for up to 600 lbs. each. The open floor plan features a bright and cheery sun room open to the eating area with sliding door to the lanai. The screened enclosed lanai has a lovely view of the lake and fenced yard. The bonus room with French doors is currently being used as an office, but would make a great hobby or exercise room, formal dining room, or perfect for extra sleeping space. Your choice. Newer gated community amenities include resort style heated pool, fire pit, outdoor BBQ grills, basketball court, playground and sidewalks. There is no CDD fee and golf carts are allowed. Location is convenient to shopping, restaurants and much more!